Corporate Mobile Cocktail Bar with a twist is one of our main strengths. 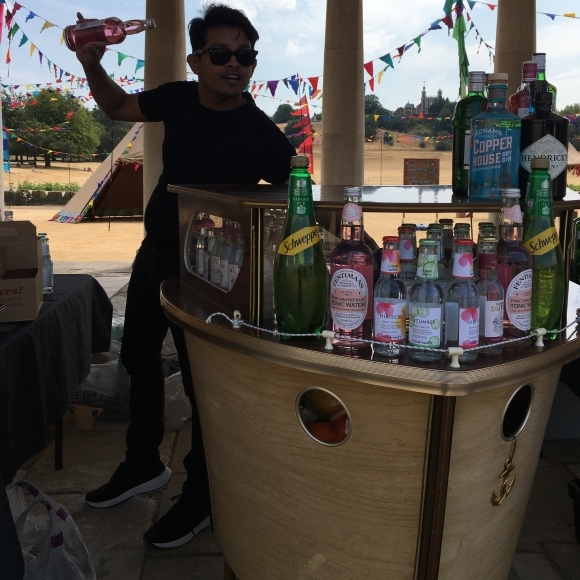 We are excited to offer a unique mobile bar hire service for awards ceremonies, product launches, exhibitions, conferences, celebrity events, film premiers, festivals or an awesome staff party like the video above with 500 staff. Our experience mix very well with any organisations around the world and provides cocktail events at the highest standard of service, in the video above you see a quick 2 minutes of what it was an absolute amazing festival Neverland themed cocktail summer party for Badoo at the Queen’s House in Greenwich, everything about our cocktail service is unique, our team will ensure that each aspect of your event is how you want it. We’ll exceed all expectations with flair and a big smile! Corporate Mobile Cocktail Bar hire from Mambo events, London, Birmingham and Manchester, hire for exhibitions and product launches. With all your competitors using the latest entertainment and technology trying to catch the attention of those very important customers you really need that extra USP to make you stand out at exhibitions, Mambo has got that Italian mixology touch which can provide exactly that. A bar service is the perfect addition to your stand at a exhibition, attracting customers in and giving you the opportunity to speak to them whilst they sip their cocktail, Mambo offer a range of exhibition cocktails to suit all needs and budgets around the Midlands in Nottingham, Leicester, Derby, Birmingham, Coventry to name a few. Get in touch today to get a bespoke quote.